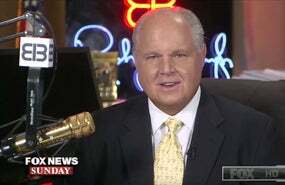 RUSH: Elements of the Drive-By Media are still having conniptions. They’re going nuts over some of the things I said on Fox News Sunday with Chris Wallace. Among those things they’re having conniptions over, my observation the First Amendment does not give the media immunity from criticism. They are shocked anybody thinks this. They are stunned that anybody would say this. They simply cannot believe it. But at the top of the list, virtually every media person that has commented, that I’ve seen, anyway. I’ve seen it all. I’ve got audio sound bites of some of this to show you, to play for you, to demonstrate for you. But I’m sure it’s more than what I have here. But I think virtually every Drive-By Media person who’s commented on it is just acting flabbergasted that I actually believe that the media is working to destroy Trump! They think it’s insane. What gives me the right to say that and how is it that I have 20 million listeners? I mean, that just doesn’t make sense. They can’t figure it out. And, folks, let me double down on this today because there is no question that’s exactly what’s going on here. None whatsoever. I’ve got two really, really brilliant pieces today to share with you, excerpts from them to back this up. One is by Michael Walsh at PJ Media. The Walsh story focuses on the deep state intelligence guys and the Obama holdovers and the effort there to unseat Trump. And now both Michael Walsh, who’s a great writer and we’ve cited him many times over the years, both Walsh and Victor Davis Hanson make no bones about it: There is an ongoing effort to replace Donald Trump, to get him out of office. That is what all of this is about. Now, the media may not be leading it, but they are complicit in it. The actual effort to undermine Trump is occurring in what we lightheartedly here refer to as the deep state. You can basically find it in the halls of Congress, people in Congress who don’t want Trump. You can find people in various federal bureaucracies who do not want Trump. You can find people at the CIA, the various intelligence agencies that do not want Trump. And they are leaking. They’re illegally wiretapping phone calls and they’re leaking what they’re hearing to the media. The media is complicit by eagerly reporting this stuff rather than calling the leakers out. It’s all illegal and they’re all playing the game together. The bottom line is — and I don’t want you to misunderstand here. I don’t want to say it’s common, I don’t mean that, but it’s not anything that hasn’t happened before. There have always been efforts to undermine the chief executive by elements of the government who do not support, do not believe for various reasons throughout our history. So this is not unprecedented. It’s just that this one happens while we’re alive, and this one happens while the guy we elected to be president and who won is the target. And we have a vested interest in preventing this effort to unseat Trump. Now, you might say, “Well, what’s the process?” It’s not really a process. I mean, you might have impeachment charges brought at some point, but it’s about paralyzing Trump. It’s about seeing to it that none of Trump’s agenda is implemented. It’s about making Trump quit or give up or just raise his hands in futility and show up but not try to irritate anybody. There are many, many different methods here. There are all kinds of different objectives. If they could get Trump literally out of office, make no question, no question they would do it. But that is at the far end of the extreme in terms of possibilities. There are other ways to render Trump ineffective or neutered and to dispirit his supporters, and it’s all happening at full speed ahead here. And I think one of the greatest indications of how I’m right is notice how anybody involved in this reacts when they are accused of this, and I’m thinking primarily here the media. I don’t think it’s a charge, it’s not an allegation; it’s a statement of fact. The media doesn’t like Donald Trump and is doing what they can to undermine his presidency. They’re doing what they can to discredit him. I mean, it’s unique in the sense that you wouldn’t find any behavior like this at all relevant to Barack Obama or to Bill Clinton, but you will find similar actions have taken place against George W. Bush and Ronald Reagan and so forth. As I say, it’s not unprecedented, but it’s serious, and it is real. And when the media is accused of having this desire and working toward the ultimate end of dethroning Trump, they act like stuck pigs. I mean, if it’s ridiculous and if it’s insane and if it’s lunacy, act that way, you know, start laughing at it, start chuckling about it, having fun with it. But, no, no, no, no, no. They’re reacting like stuck pigs. RUSH: Yeah. Shadow government, deep state, whatever. I’m convinced there is a shadow government. There’s an Obama shadow government. It’s not my idea, by the way. I’ve seen it referenced by others. I happen to believe it, and they’re just the Obama holdovers. And they’re organized. I mean, that’s the whole point about the difference in the Democrats and Republicans. The Democrats organize for things like this. They plan for losing elections and making sure that their lifetime appointees are active organizers, not just placeholders. RUSH: I went back and forth on even playing this, ’cause this is just absurd. But I decided to play it because it’s an illustration of just who the media is and how off the wall and unobjective and unaware that they are. And it also demos what their agenda is. Now, you may have heard that the CPAC people had invited Milo Yiannopoulos to keynote the CPAC convention which starts this weekend. And there was an up furor mainstream conservatism over this. Many were just curious, angry. “How in the hell could this happen? Who thinks that Milo Yiannopoulos is mainstream conservatism?” So, anyway, a videotape was uncovered of Milo talking about things that could be construed to be pedophilia. CPAC pulled him. They yanked his appearance. Simon & Schuster has now canceled the book contract they had with him. So he’s not going to be there. This is red meat for the media, and it was actually served to them. They didn’t have to make this up. CPAC actually gave them this one. But I want you to listen. This is Alisyn Camerota. Now, Alisyn Camerota used to be at Fox. And I’ve only met her a couple times. She’s nice as she could be, and she asked me I don’t know how many times… She was the weekend host of the Saturday edition of Fox & Friends, the early morning show. She politely asked me over and over to appear on the program, and ultimately I said, yes, I would do it. It was a phoner. She was perfectly fine, she was perfectly nice, and she knows who I am. She knows what I do and who I am. But you’d never know it listening to this sound bite. She’s talking with Chris Cuomo, who thinks communism is about elevating economic standards for people. He really gave the Cuban dictators a piece of his mind. He said, “When are these communists gonna understand they’re gonna have to start improving living conditions for people?” I saw that and I said, “What? When has communism ever done that? That’s not what communism does.” Anyway, he thinks it is. He’s the son of Mario “The Pious,” the late Mario the pious, former governor of New York and just would be… Oh, my God, they couldn’t wait for him to be elected president. But it never happened. So they’re talking about Milo and CPAC canceling his appearance. CUOMO: — in terms who’s succeeded on that. I mean, this guy… To compare this guy from Breitbart to Trump is insulting to Trump. CAMEROTA: Well, I’m not comparing him to Trump. I’m comparing him to Rush Limbaugh and to other right-wing radio hosts. CUOMO: It’s even insulting to those guys. CAMEROTA: I get it, but I think that what your point was is that people who sort of say the most outlandish things right now — and, as we know, they don’t necessarily have to be fact based — get a lot of attention. RUSH: Right. So Alisyn Camerota has decided that I am Milo Yiannopoulos. Now, how absurd — and she knows better. She’s not it’s not even close. It’s ridiculous. It is preposterous. And yet there she is on CNN drawing the comparison on the basis that I don’t mean what I say. I’m just a provocateur. I’m just saying what I say to attract attention to myself. If I wanted to attract attention to myself, I’d be doing television every day. If I wanted to attract attention to myself, I’d have a PR firm and you’d be seeing nothing but stories about me in the media every day. I do not want any part of that. I’ve been there, done that, and it’s phony baloney, plastic banana, good-time rock ‘n’ roll. I’m not into that at all. I’m not into being promoted. I just tell people what I think, and it used to be things that she agreed with. So this is an example where the media thinks everybody over here is off-the-charts false, untrue, saying things just to get noticed. And she doesn’t even see, nor do any of the others in the media. They have no sense of self-awareness. (chuckles) They really don’t. They haven’t the foggiest idea why people are angry at ’em. The media is the only business in the world where the customer is always wrong. If you’re a news consumer, if you’re a customer, and you complain to them, they will tell you that you are not sophisticated enough to understand what they do, and they’re tell you to go listen or watch somewhere else. They’re not even really doing the news for you. They’re doing news for other journalists and other people in government because that’s their real audience, as evidenced by CNN’s ratings. They don’t have any compared to other news organizations, and they don’t seem to be bothered by it at all. They don’t seem to be doing anything to try to change it at all, or very little. RUSH: Okay. Today CNN’s “New Day,” Michael Smerconish, who used to host the morning show on our Philadelphia affiliate, and I’ve met him. I went in, I did a Rush to Excellence appearance there at Philadelphia. What a great room it was. It was on the campus of the University of the Arts. Camille Paglia teaches there. It was just a beautiful room, sold-out crowd, big. Backstage Smerconish’s father was there, said he was a big fan, and Smerconish was very nice, very complimentary. So here he is on CNN’s “New Day” today, and he’s with Chris Cuomo, and they’re talking about Milo Yiannopoulos being canceled by CPAC. SMERCONISH: Donald Trump is the embodiment of a 30-year trend in the making, an embodiment of empowering Rush Limbaugh, the Drudge Report, Fox News, Breitbart, NewsMax. They exert control over primary voters in a way that the traditional conservative leadership used to do. And that’s why Milo Yiannopoulos would even be extended an invitation to come to a gathering like CPAC. But the problem is that that comes at the expense of reaching a much more middle of the road audience than you need in a general election. Well, I don’t even understand if I define these words, as I know their meaning, this doesn’t make any sense. Who empowered me, Mr. Snerdley? What does this even mean? What is he trying to say? No, no, no, he’s not trying to say I earned anything at all. That’s the whole point. I did earn it. Nobody empowered me. You know, women talk about empowerment, feminists talk about empowerment. What do they mean by this? It’s like I told my friend when he asked me, “Are they gonna give Trump –” No, he’s gonna have to win it. He’s gonna have to beat everybody. He’s gonna have to earn it. What is this empowerment stuff? And what is the embodiment of empowerment? They probably understand it at Harvard or Brown, but it doesn’t make any sense. And who empowered Drudge? I mean, who is this all-powerful empowerer who is sitting up there deciding who’s gonna succeed and who isn’t? I’ll tell you who it is: It’s the American people. If I’m empowered by anybody, it’s the American people. But that’s not how this works. Anyway, the point is they’re sitting out there, and, of course they’re at, as Trump would say, “the failing CNN,” and they’re looking at all these other things, and it can’t be explained in their world. It can’t be that I am legitimately the most listened to talk show. It has to be somebody’s made it happen. There’s a sinister something or other going on out there that is empowering me and Drudge and Fox News. 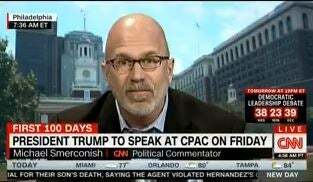 Now, Smerconish was a conservative when he was on the radio in Philadelphia. Well, he used to be. One more. This is little Brian Stelter, the media guy at CNN, yesterday talking to Brooke Baldwin. They’re just beside themselves here over the fact that I said that the media didn’t make Trump so they can’t destroy him, and they’re beside themselves that I said that they have a blueprint, that the Democrats and the media have a blueprint for destroying Republican political officials. I said it’s not gonna work on Trump because the media didn’t make Trump, they couldn’t break him. That’s what they’re talking about here. BALDWIN: This is a guy who has like tens of millions of listeners. It just makes me wonder how many people believe that. STELTER: Well, certainly somebody like Rush Limbaugh’s been trying to erode trust in the mainstream press for a long time, for decades. Part of his appeal is that he’s anti-media, and we’ve seen that across the board. Trump is tapping into that. Trump is picking these fights because the media is powerful. In some ways he’s going after the media instead of the Democratic Party because the Democratic Party is pretty weak right now and Trump needs an enemy. It’s part of a broader issue for this White House. That’s why there’s been aggressive coverage. It’s not because a journalist is trying to take down the president. It’s not because they voted against him or for him. It’s because we’re continuing to hear this series of false statements. RUSH: Really? Trump wants this. That’s right, folks, Trump needs an enemy. He needs it. And of course I, my appeal is anti-media, and I have been eroding trust in the mainstream press for a long time, for a decade. I’ve been eroding trust in nothing. You people in the media have been doing it. All I do is tell people what you do and why. I mean, I play audio sound bites of you people saying what you say. Anyway, so this is what happens when you become a victim. This is exactly what happens when you become a victim, and when you become a liberal victim to boot. You lose your mind. “Yeah, Trump, yeah, the Democrats, they didn’t win anything,” which is true and they’re in big trouble. “So he can’t go after the Democrats. He needs an enemy,” like Trump wants this. Anyway, and of course that’s why there has been aggressive coverage because Trump is — what did he say? Trump is tapping into the embodiment of empowerment that led to me, I guess. RUSH: All right. Imagine if Ted Cruz had won the Republican nomination and had become president. Imagine if Ted Cruz is elected. 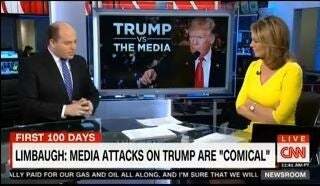 Do you think the media would be any different substantively than they are with Trump? The intensity of opposition and smearing would be identical. It might be focused in different areas or ways, but do you think there’d be any honeymoon with Cruz? Maybe with Jeb there would have been. Maybe with Romney. No, no, no, they’d go back to destroying Romney, too. It’s the same, doesn’t matter who, folks. That’s the point. RUSH: Bob, great to have you on the EIB Network. How are you doing today? CALLER: Doing well, Rush. How you doing? RUSH: Fine and dandy. Thank you much. RUSH: No, no, no. (laughing) No, no, no, no, no, no, no, no, no. Let me tell you something. I myself asked the same question you’re asking. I don’t have time to tell you the whole story, but a journalist was preparing a smear hit piece on me back when I was doing the TV show. And he was gonna lump me in with people that I had nothing in common with. It was a definite hit piece. Then F. Chuck Todd came along with a tweet. I’m paraphrasing the tweet. Chuck Todd at NBC News said that this is un-American. You just you can’t undermine the media like this. The media has constitutional designation. And I said, “There it is.” And so Bob, the answer, the honest, serious answer, which you aren’t going to really believe anybody could think, but they do. I think they’re taught this. You know, everybody’s a young skull full of mush at some point, and then there’s people that fill that skull full of mush up with gibberish or brilliance. And these people have gone to journalism school, they’ve been indoctrinated with liberalism all their lives. They really believe that if you criticize journalists, you’re undermining the Constitution because they have constitutional immunity since the press is mentioned, the freedom of the press is mentioned, you attack them and you’re attacking the Constitution. You’re attacking America. Well, then if it’s the case, why can anybody in government be attacked? But that’s what they think.